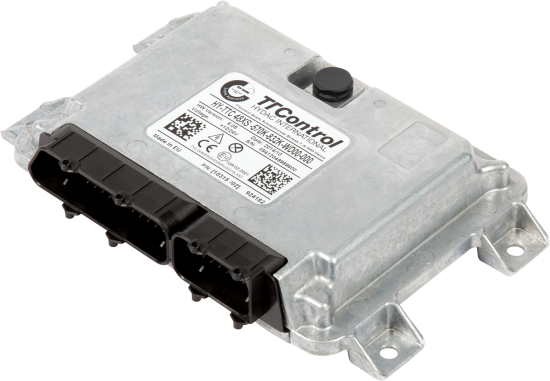 HY-TTC 48XS is an intelligent safety I/O module for extending the number of I/Os. The I/O module acts as a slave and is used in combination with, and controlled by a master electronic control unit and communicates via the standardized CANopen protocol, parameterized according to CiA DS 401. It is also compliant to the European Standard EN 50325-5 for CANopenSafety and is developed in accordance with the international standard EN ISO 13849 on functional safety, performance level (PL) d. One or more I/O modules can be used in addition to the master control unit in a modular way. This distributed architecture makes the design and assembly of different vehicle variants possible and more cost and time effective. In addition cabling is simplified and more economic. Another key advantage is that it is possible to set up a distributed system where I/O modules (HY-TTC 48XS) take over safety relevant functions. The HY-TTC 48XS is delivered with a ready-to-run software. The application has to be implemented for the master only and interfaces with the slave module via CANopenSafety. This makes the setup user friendly and saves development time. It is part of a complete and compatible product family and is protected by a compact, automotive-style housing suited to mobile applications in harsh environments.